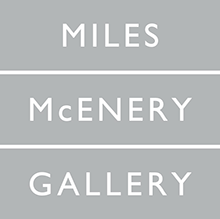 NEW YORK, NEW YORK – MILES MCENERY GALLERY is pleased to present an exhibition of recent paintings by Michael Reafsnyder and Patrick Wilson, on view 6 September through 6 October at 520 West 21st Street. A public reception will be held for the artists on Thursday 6 September from 6:00 to 8:00 p.m. The exhibition is accompanied by a fully illustrated publication, featuring an essay by Shana Nys Dambrot. The seemingly disparate styles of Southern California artists Michael Reafsnyder and Patrick Wilson are brought together in this exhibition, creating an opportunity to rethink initial assumptions regarding the nature of their paintings, and allowing for an expanded conversation around their af nities, connections, and concerns. The pairing is strengthened by the artists’ longstanding friendship, which revolves around daily discussions about painting and life. 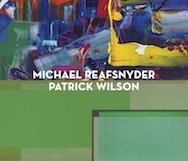 Both Reafsnyder and Wilson’s polychromatic works burst with vibrant, saturated color and dynamic compositions. Reafsnyder loads thick layers of acrylic paint across the surface of the canvas while lines, squiggles, and smiley faces—often squeezed directly from the tube—are layered across his variegated surfaces. Infused with a sense of joy, Reafsnyder’s paintings ask us to reconsider our assumptions about gestural abstract painting. 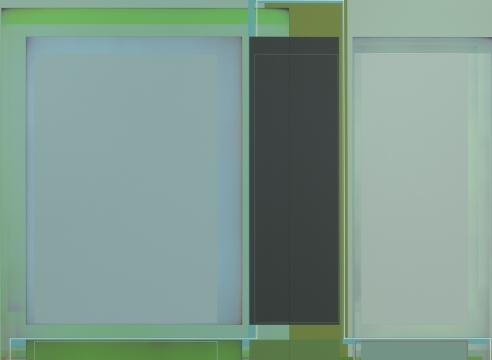 Wilson layers intense geometric forms, setting the viewer adrift into a glorious realm of indeterminate space. Magni cent in their precision, Wilson’s paintings present a space of visual splendor. Not content with static compositional solutions, Wilson complicates what we have come to expect from geometric abstract painting. 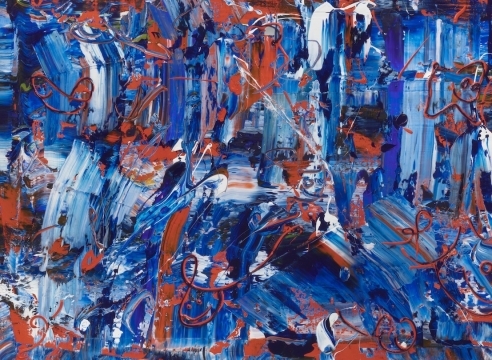 Ultimately, the pairing of Reafsnyder and Wilson allows an opportunity for viewers to engage with the many pleasures abstract painting affords. Seeking to rethink what is possible in painting, Reafsnyder and Wilson make works that are liberated from broad generalizations and delve into the present moment where life unfolds. MICHAEL REAFSNYDER (b. in 1969 in Orange, CA) received his Bachelor of Arts degree in studio art at Chapman University in Orange, CA in 1992 and his Master of Fine Arts degree at the Arts Center College of Design in Pasadena, CA in 1996. He has had numerous exhibitions nationally and internationally. Solo exhibitions include, “Sunday Best,” Susanne Vielmetter Los Angeles Projects, Culver City, CA; “Delight,” Marty Walker Gallery, Dallas, Texas; “Fresh,” W.C.C.A., Singapore; “More: Paintings and Sculpture from 2002-2005,” Las Vegas Art Museum, Las Vegas, NV; “Yum-Yum,” Uplands Gallery, Melbourne, Australia; and “Paintings,” Galeria Marta Cervera, Madrid, Spain. Recent group exhibitions include “Works of Paper II,” ACME., Los Angeles, CA; “Recent Acquisitions,” Barrick Museum, University of Nevada, Las Vegas, NV; “Paths and Edges: Celebrating the Five-Year Anniversary of the Escalette Collection,” Guggenheim Gallery, Chapman University, Orange, CA; “Floor Flowers,” Peggy Phelps Gallery, Claremont Graduate University, Claremont, CA; and “Keramik,” Pacific Design Center, Los Angeles, CA. His work may be found in the permanent collections of the Columbus Museum of Art, Columbus, OH; Harvard University, Cambridge, MA; Laguna Art Museum, Laguna Beach, CA; Las Vegas Art Museum, Las Vegas, NV; Los Angeles County Museum of Art, Los Angeles, CA; Portland Art Museum, Portland, OR; and Museum of Contemporary Art, San Diego, CA, among others. PATRICK WILSON (b. 1970, Redding, CA) received his Bachelor of Arts degree at the University of California, Davis in 1993 and his Masters of Fine Art degree at Claremont Graduate School in Claremont, CA in 1995. He has had numerous solo exhibitions, including Susanne Vielmetter Los Angeles Projects, Culver City, CA; “Evolving Geometries: Line, Form, and Color,” Center for the Arts at Virginia Tech, Blacksburg, VA; “Steak Night,” Susanne Vielmetter Los Angeles Projects, Culver City, CA; “Patrick Wilson: Pull,” University Art Museum, California State University Long Beach, Long Beach, CA; “Slow Motion Action Painting,” Marx & Zavattero, San Francisco, CA; and “Slow Food,” Curator’s Office, Washington, D.C.
Beach, CA; “On the Road: American Abstraction,” David Klein Gallery, Detroit, MI; “Geometrix: Line, Form, Subversion,” Curator’s Office, Washington, D.C.; “NOW-ISM: Abstraction Today.” Pizzuti Collection, Columbus, OH; “California Visual Music – Three Generations of Abstraction,” Guggenheim Gallery, Chapman University, Orange, CA; “Local Color,” San Jose Museum of Art, San Jose, CA; 2010 California Biennial, Orange County Museum of Art, Newport Beach, CA; “Keeping it Straight: Right Angles and Hard Edges in Contemporary Southern California,” Riverside Art Museum, Riverside, CA; and “Gyroscope,” Hirshhorn Museum and Sculpture Garden, Washington, DC. His work is included in many public and private collections including the Columbus Museum of Art, Columbus, OH; Crocker Art Museum, Sacramento, CA; Hirshhorn Museum and Sculpture Garden, Smithsonian Institution, Washington, D.C.; Long Beach Museum of Art, Long Beach, CA; Los Angeles County Museum of Art, Los Angeles, CA; the Orange County Museum of Art, Newport Beach, CA; and the San Jose Museum of Art, San Jose, CA. Wilson currently lives and works in Los Angeles, CA.